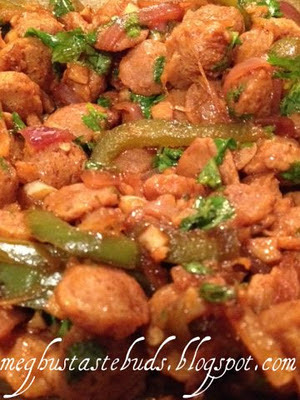 This recipe is an adaptation from one of my favorite Indian food blogs called Veggie Belly. Veggie Belly is one of the blog I frequent a few times a week. Reading her stories, seeing her recipe ideas and learning from her stunning photography (one of the best features of her website) makes me even more excited to try something new or jump into the kitchen. Sala, the talented author, creates amazing vegetarian and vegan recipes ranging from Indian food to Thai, Mexican and anything in between. I usually can’t wait to try out her recipes. One evening Hubby and I were brainstorming our grocery list for the week and trying to come up with ideas for new foods to experiment with. “Let’s have mushrooms” Hubby said. I never have enjoyed their taste. The fact that they are in the fungus family doesn't help either. The next morning I logged on to Veggie Belly and saw a new post for a creamy and rich dish made for mushrooms. The mouth-watering photos of a dish with spicy red sauce that look irresistible. I had a hard time believing it was for Mushroom Tikka Masala. There was just no way mushrooms could look so appetizing. This opened my mind to trying out her recipe. I figured I might as well try it and if I didn’t like it Hubby could enjoy it all to himself. At least I would learn how to make a good tikka masala sauce. So I added mushrooms to my grocery list. Later on that afternoon, I was watching one of my favorite cooking shows Good Eats and the episode was all about mushrooms! It even included how to sauté them using Ghee (clarified butter which is widely used in India). I thought to myself, “I’m starting to get the message that I should try this dish." Then one night, Hubby showed up with these in his hands. No he was not in the dog house and yes, I certainly did enjoy them. I also thought a random act of kindness like that deserved fulfilling Hubby’s request for mushrooms. After a trip to our local Indian grocery store, I got home and began chopping mushrooms and bell peppers while listening to a Harry Potter audio book in the background. I’m a bit slow when trying out a new recipe, constantly looking back at the instructions, so it took me about two hours to make it the first time. The results made the time feel well worth it. It ended up being one of the best dishes I have ever made. Rich and creamy and bursting with flavor. I couldn’t believe mushrooms could taste so good! I’ve made this dish a few times now and have it down to about an hour and half, a considerable time commitment. Due to the amount of time this dish takes I decided to make it an “advanced” dish, although there is nothing actually difficult about it. But it does take a good amount of chopping, stirring and flipping, efforts which I feel are well worth it. I’m actually learning to really enjoy the simple acts of chopping an onion or bell pepper, stirring a yogurt sauce or keeping a close eye to make sure my mushrooms are perfectly browned before flipping them. I’m learning to take my time, even hours, knowing I am creating a delicious dish. I know for most people, this may be a dish to try on the weekend when you have more time. But do try it, it’s irresistible. Sala from Veggie Belly wrote the original recipe for a guest post on Rasa Malaysia. I have added three adaptations of my own. One from the Good Eats episode “The Fungal Gourmet” where I separately sautéed the mushrooms in ghee and added them to the sauce. I also separately sautéed the bell peppers in olive oil because Hubby prefers fried bell peppers as they don’t get slimy. The last change I made was using my favorite yogurt based sauce technique from my chole recipe. Kasoori Methi - Dried fenugreek leaves which have a characteristically bitter taste and pungent smell. Kasoori methi is widely used in India and is usually sprinkled over meats and vegetable sauces to round out the spices. It is reported to be a healing aid for Arthritis pain. It has a similar taste to celery and fennel but with a stronger flavor. A possible substitute if you do not have access to kasoori methi is to use dried celery leaves with a pinch of ground fennel. You can leave this ingredient out of the dish if you don't have access to it or to a good substitute, however it adds a great depth of flavor and I highly recommend you get a box if it's within your reach. tip: to cut down the cooking time, work on prepping and cooking the vegetables while waiting for each stage of the sauce to finish. Heat oil in a large saute pan. When the oil ripples on the surface add the cumin seeds. Once they begin to sizzle add the onions and the salt. Cook on medium heat till onions turn brown. Then add the garlic and ginger paste and stir for about a minute or two until the smell of the raw paste disappears. Pour in the tomato puree and let it cook till the oil separates from the tomato sauce and the tomato sauce thickens a bit, about 5-8 minutes. Meanwhile mix the coriander, cumin, turmeric and chili powders into the yogurt. Add the yogurt to the saucepan once the tomatoes are done and stir consistently for 3 minutes. TIP: Add the yogurt to the pan in small quantities, a few spoonfuls at a time. Fully incorporate each added batch of yogurt before adding the next batch. If you add all the yogurt at once, it tends to curddle. Working in small batches helps prevent the yogurt from curdling. While the sauce is cooking, work on the mushrooms. Some button mushrooms come in pre-washed packages but you can wipe the mushrooms clean with a paper towel or brush them off if you wish. You can also rinse them in a colander or submerged in water in the sink if you can plug your drain. Slice the mushrooms into quarters or thirds. Thinner sliced mushrooms will make for a successful sauté. Put another sauté pan on medium high heat and ladle on a tablespoon of ghee (clarified butter) or your preferred oil. Keep the oil pretty hot but not to the smoking point. Drop in a handful of mushrooms. Make sure all the mushrooms are touching the hot pan so be careful not to overcrowd the pan. The mushrooms will sizzle and brown on one side, this will take 2-3 minutes. Once they are golden brown and have a bit of a crust on them from the sauté, flip each and every mushroom piece over and sauté the other side. Once that handful of mushrooms are beautifully golden and crusty, move them out to the sides of the pan where the heat is less and add another handful. You can also just spoon out the finished mushrooms and drop them into the sauce but only if your sauce is finished. Continue until all the mushrooms are cooked. courtesy of Good Eats "The Fungal Gourmet"
1. Cut the mushrooms so they are all the same size. I think it is easier to saute when mushrooms are cut thin and uniformly. 2. Use a heavy pan. A heavy pan heats evenly and stays hot. A sauté pan will provide the widest cooking surface since it is wide and has straight sides. 4. Choose the right fat, one that can take heat and adds great flavor. You want a high "smoke point", which means the fat can get pretty hot before starting to smoke (once it reaches the smoking point, it goes rancid quickly and is no longer ideal for cooking). If you can get a fat that can maintain high heat you can get a better browning in your saute. You also want a fat which adds great flavor because mushrooms act like sponges. You could use olive oil; coconut oil has a higher smoke point but the best is clarified butter (ghee). Butter adds rich flavor and because it's clarified it has a higher smoke point. Successful sauteing means not over crowding the pan. Every mushroom needs to have full contact with the pan. The high heat will cause water that seeps out of the mushrooms to evaporate immediately (causing the sizzling sound of the saute). With the moisture disappearing immediately, they food will quickly brown and build a crust which seals in flavor. Keep it hot and let there be plenty of room. While your mushrooms are sautéing, start preparing the bell peppers. Heat another sauté pan on medium-high heat. Once it is hot (but not smoking), add the olive oil (you can substitute it with another high-heat cooking oil if you wish). Dice the bell peppers into bite-sized cubes and add them to the oil. Stir the bell peppers occasionally until they fry evenly (about 8-10 minutes). Once all your mushrooms and bell peppers are finished, add them to your sauce. Crumble and crinkle the kasoori methi over the sauce by placing it in the palm of your hand and then rolling and crushing the leaves between your palms, letting the powdered leaves fall into the sauce. Cook on medium heat for about 3 minutes. Sprinkle on the garam masala and mix well, let it cook for a minute. Be sure to taste test and adjust the spices if necessary. Turn off heat and stir in heavy cream if you choose to use it. Garnish with chopped cilantro. Serve with a side of chapatis, naan or rice. Accompany with cuts of cucumber slices drizzled with fresh lemon juice and a pinch of salt for a cooling effect that cleans the palate. If you try the recipe, let me know how it goes. Write me a comment or send me an email here. A Curry of a Life has been featured on BlogHer and Foodista, and is regularly featured in the Santa Cruz Media Lab and Santa Cruz Sentinel. Check out ACL’s Facebook page, or send comments and questions to acurryofalife@gmail.com. Sala from Veggie Belly wrote the original recipe for a guest post on Rasa Malaysia. I have added three adaptations of my own. One from the Good Eats episode “The Fungal Gourmet” where I separately sautéed the mushrooms in gee and added them to the sauce. I also separately sautéed the bell peppers in olive oil because Hubby prefers fried bell peppers as they don’t get slimy. And the last change I made was using my favorite yogurt based sauce technique from my chole recipe. Heat oil in a large saute pan. When the oil ripples on the surface add the cumin seeds. Once they begin to sizzle add the onions and the salt. Cook on medium heat till onions turn brown. Then add the garlic and ginger paste and stir for about a minute or two until the smell of the raw paste disappears. Pour in the tomato puree and let it cook till the oil separates from the tomato sauce and the tomato sauce thickens a bit, about 5-8 minutes. Meanwhile mix the coriander, cumin, turmeric and chili powders into the yogurt. Add the yogurt to the saucepan once the tomatoes are done and stir consistently for 3 minutes. While the sauce is cooking, work on the mushrooms. Some button mushrooms come in pre-washed packages but you can wipe the mushrooms clean with a paper towel or brush them off if you wish. You can also rinse them in a colander or submerged in water in the sink if you can plug your drain. Slice the mushrooms into thirds or in half, depending on your preference. Put another sauté pan on medium high heat and ladle on a tablespoon of ghee (clarified butter) or your preferred sautéing oil. Keep the oil pretty hot but not to the smoking point. Drop in a handful of mushrooms. Make sure all the mushrooms are touching the hot pan so be careful not to overcrowd the pan. The mushrooms will sizzle and brown on one side, this will take 2-3 minutes. Once they are golden brown and have a bit of a crust on them from the sauté, flip each and every mushroom piece over and sauté the other side. Once that handful of mushrooms are beautifully golden and crusty, move them out to the sides of the pan where the heat is less and add another handful. You can also just spoon out the finished mushrooms and drop them into the sauce but only if your sauce is finished. Continue until all the mushrooms are cooked. Serve with a side of chapatis, naan or rice. Accompany with cuts of cucumber slices drizzled with fresh lemon juice and a pinch of salt for cooling effect that cleans the palate. In a microwave proof cup add the chunks, 2 pinches of salt and water (enough to cover the chunks). Cook for 4 to 5 mins or till the chunks are tender. Remove once they are done and run the chunks under cold water for 2 mins. Next squeeze the water from the chunks and keep aside. Now time to start the tempering. Heat oil in a wok, add the garlic & saute for 1 min. Add the onions, green chillies and ginger & saute for 3 to 4 mins. Then add the peppers saute further for 2 mins. Next add the soy sauce, ketchup, vinegar and the soy chunks. Saute for 3 to 4 mins. Lastly add the salt and cilantro. Note : If you like super spicy then add green chilli sauce. You could add spring onions too. Take one bowl of peanuts and roast them on a pan for around 10 minutes. Keep on stirring.Let it cool down and then blend it into blender for 3-5 seconds. We don’t want smooth texture of powder. In a bowl, mix tomatoes, onions, grated cucumber, chillies and curd. Add sugar and peanut powder. Mix it well. On the last moment before serving add salt to taste. Garnish with coriander. Cucumber releases water after adding salt hence, salt to add on last moment. It goes well with Paratha, Rice, Rozeto, or just like that. Heat the oil in a large skillet over medium heat. Add the chicken style seitan, and cook until browned, stirring occasionally. Add the bell pepper, onion, and garlic. Cook and stir until tender, but still crisp. Stir in the pineapple juice, brown sugar, vinegar, soy sauce and cornstarch. Reduce heat to low; cook and stir until thickened. Mix in the pineapple chunks just before serving.